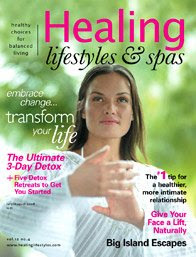 Here’s my little article about Canyon Ranch in the September issue of Healing Lifestyles & Spas. I’m not particularly proud of it as a piece of writing, but am grateful that being a travel writer gave me an excuse and the means to go on the adventure. I’m also honored to share the contributors page this month with Deborah Madison, who wrote an article about ancient grains. Thanks for reading, Rachael (and for the link!). I’m afraid you’ll have to get in line to carry my bags, but YOU could pitch your own spa article…kid/mama spa experiences are a huge trend these days…I’m not particularly in favor of this trend, but it’d certainly be a nice twist to read an article about a butchmommydaddy getting a chocolate ice cream-scented pedicure with her cute little boy. You could also pitch a butchmommydaddy DOCTOR’S WIFE solo spa outing. Isn’t there some travel magazine that caters to doctor’s wives? Departures? Good luck!